Gray and Sam are brother and sister and best friends, flatmates in New York City, where she creates ad campaigns and he's a surgery intern. Their social life is too insular, so they head to a dog park so Sam can, maybe, meet a woman. He does - Charlie - a zoologist new in the city; he likes her immediately, and the feeling seems mutual. As the three of them spend time together, what if Gray's feelings for Charlie aren't just sisterly? Not only might this explain her solitary life, but it could lead to real dilemmas - with Charlie (who's sweet, but a bit opaque) and with Sam. 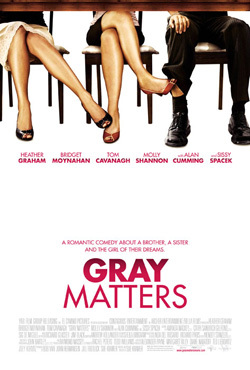 No advice comes from Gray's therapist, but a co-worker and a cab driver give theirs.